According to the U.S. Census Bureau as of 2012, 112 million Americans over the age of 18 are unmarried. That number makes up almost half of the adult population. In years past, you were expected to have a quality long-term relationship and eventually a marriage for a “normal” life. More recently, the trend seems to be: remain single and date several people over time. If you are interested in having a serious relationship at some point in the future, here are a few details to keep in mind. Many Americans have chosen to live the lifestyle of a serial dater — someone who constantly goes on dates with many different people. A serial dater is looking to fill a void because he does not want to be alone yet he does not desire a serious relationship at the time. This is not a person that you want to spend a lot of time on if you want a serious relationship. Here’s a quick test that will tell you if you are on a date with a serial dater: ask the length of his last three relationships. If the response is just weeks or months then you are most likely on a date with someone who dates frequently to stay busy, but not necessarily because he’s looking for someone to settle down with. And you also have to consider whether you may be the serial dater. Maybe you’re just speculating on a serious relationship, but not actually ready for one at the moment. In a modern atmosphere where a “hi” and “bye” text passes for daily communication, the art of conversation has become somewhat passé. But the truth of the matter is that people fall in love in conversation. If you find yourself having long, luxurious, meaningful, two-sided conversations with your guy that flow effortlessly for hours, then that’s an indication that you might just have something real going on. When two people talk about their dreams, loves, likes, family, future and other things of importance, this forms a bond that’s hard to break. There are a number of other signs that a new relationship is going somewhere. One clue is when your mate puts you in future tense language. For example, he talks about where you’ll live together in five years or includes you as a factor in his career decisions. Another way that you’ll know when a relationship is real is when he wants you to meet his family and when you do meet them they already know plenty about you. Spontaneous romance is also a sign that a guy cares a lot for you — when he plans things in advance like special dates and romantic nights together, it shows that he thinks of you often and really wants to make you happy. Before you enter into a meaningful relationship with anyone, it is so important to first know yourself and be clear about that. It’s very easy to lose yourself — the essence of who you are — in a relationship. If you can stay true to your beliefs and values, it shows a strength that will transcend the relationship. It also shows that he respects and loves you for who you are as a person. In her amazing book The Power, Rhonda Byrne tells the story of a woman who envisioned having a white Calla Lily in her hand. When she went to a friend’s dinner party there on the table was a vase full of white Calla Lilies. But this woman didn’t rush to grab the flower — she patiently waited for it to manifest in her hand. As she was leaving, something compelled the host’s daughter to grab a Lily and put it right in the woman’s hand. She was patient and received exactly what she wanted. Have you ever been in a social setting where a guy who caught your eye seemed reluctant to approach you, even though you really wanted him to? Maybe he just didn’t notice you at all and you really wanted him to. 2) Decided to go after HIM instead. I am a firm believer that if it’s meant to be, it’s meant to be. 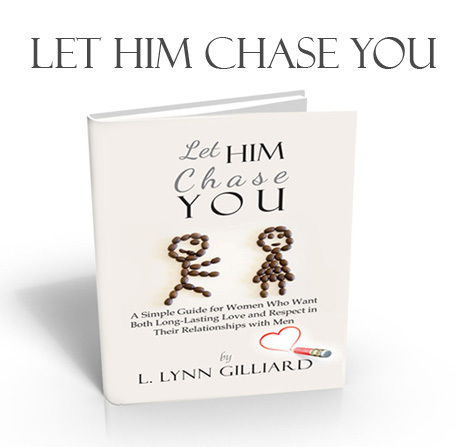 I am also a firm believer in the premise of my book Let Him Chase You. If you’re meant to connect with a particular guy, some way and some how he is going to get in touch with you. Now some women will tell you that this advice is silly — that if you see a guy you like you should go after him. Snag him, tag him and drag him home! But I know from personal experience that this is a recipe or disaster if you are seeking a fulfilling long-term relationship with a guy. I remember back when I was in college I walked out of a club and saw a really good looking guy standing there. He looked me up and down like he was interested but didn’t say anything and looked away. I then asked him if he was going to ask me for my phone number, and he did. This quickly turned into a long term friends with benefits relationship. Long story short, I was playing that role of the chaser from then on. When we got into an argument, I was the one who had to call and apologize. When he moved back to his home city, I was the one who flew out to visit him. Finally, I got tired of all of the nonsense and left him alone completely. When you force the issue with a guy, it creates an uncomfortable dynamic for us women. So like the woman in Rhonda Byrne’s book, don’t desperately grab for a man’s attention — let the guy come and place the Lily in your hand. Even if he doesn’t, don’t feel bad about it… be thankful because you may have avoided a stressful, draining and time-consuming experience with a guy who wasn’t right for you after all.